Remastered Import coupling of their 1975 self titled album with Helluva Band (1976). 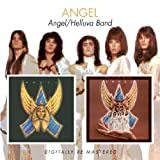 Angel was a ’70s heavy metal band based on the East Coast featuring singer Frank DiMino, guitarist Punky Meadows, and keyboard player Greg Giuffria. Packaged in a slipcase with new sleeve notes. BGO. 2006.